All axle/spindle systems will essentially have the same type of wheel bearings and the key to ensuring bearing longevity is lubrication. How often you need to repack your wheel bearings is dependent upon the size of your wheel, load weight and miles traveled. Smaller wheels spin faster and go through more rotations per mile than larger wheels and therefore need to be repacked more often. While a larger wheel supporting less weight may perform for up to 10,000 miles it is a good rule of thumb to have your travel trailer wheel bearings repacked every 3,000 miles or annually regardless of wheel size and load weight. Improperly maintained wheel bearings can lead to your wheel falling off destroying both your vacation and your trailers contents. Repacking your wheel bearings can be a messy job and even unsafe if you've never done it before. 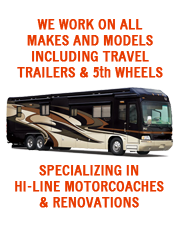 Stay clean and safe by having an authorized RV repair center service your wheel bearings and inspect your brakes. © 2010-2019 Apache RV LLC.